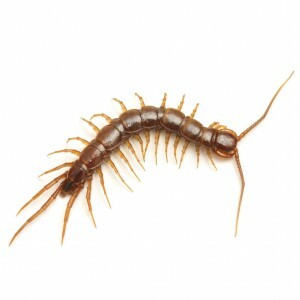 Centipedes can become a perimeter pest to any structure. If given the chance, their numbers can reach high enough levels around the home which will lead to seasonal migrations inside living areas. This article will provide detailed information about this insect, why they can be a problem and how to treat local problems in and around the home. Centipedes like to live in the same environment as millipedes, sowbugs, pillbugs and scoprions. There are two common species of centipede in the United States. 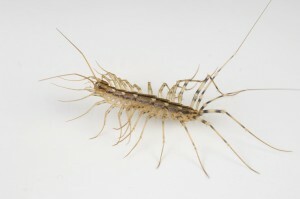 The common house centipede which has long antennae and 15 pair of long legs. The other species is more “snake like” and commonly mistaken for a millipede. They gyrate when they crawl which seem to bother most people. Both species are aggressive hunters and will bite if handled. And though they’re bite is not lethal, it can hurt and cause adverse reactions. For this reason one should avoid handling centipedes. And this video gives you a good idea of how they move. Both species can move rapidly and will commonly stop and go for long periods of time when on the prowl. The second species of centipede is both larger and longer. More common in the south, this centipede can grow to over 5 inches long. Since centipedes tend to forage in “nasty” locations, they can carry a wide range of germs and bacteria. They bite is well documented but its more likely the amount of disease they spread has more of a direct impact on people. Like millipedes, centipedes are slow to develop. They like moist areas to nest and roost. These areas include mulch, pine straw, thatch, leaves and under rocks or logs. The big difference between centipedes and millipedes is that centipedes like to eat other insects. For this reason, CENTIPEDE TRAPS can be helpful. Please these where you either see or suspect centipedes may be active. Traps should be spaced 10-15 feet apart and set along baseboards or routes of entry like on either side of a garage or patio door. 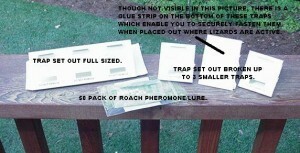 These traps use a range of insects for bait which will attract hungry centipedes. Once they enter, they’ll get stuck on the tacky glue inside and caught. Centipedes are one of the few predators which feed on spiders. They prefer to move at night, but like millipedes will migrate any time of day during certain conditions. Its not uncommon to have them migrate when water levels rise. This commonly happens during the winter and spring rains. Centipede nests may host several hundred and when they migrate, all will move in the same direction. This will lead to infestations in the home if allowed to live comfortably outside.. Controlling centipedes can involve a series of steps. The first is identifying nest sights. This will allow you to minimize the conditions these pests require to nest which will lead to less wanting to be inside your home. Look to see where they will invade. In most cases, you will find them along one side or wall of your home. Inspect nearby mulch, compost piles, wood piles, large rocks, pine straw, sheds, cracks in cement walkways or driveways and stoops. Any of these locations can breed, feed and shelter these pests. Once you know where they might be nesting, you will be able to treat these areas precisely and remove excessive organic matter available for them. Clean up leaves. Replace old straw that is decomposed. Move log piles away from the home. Seal cracks in cement which allow water to gather. Rake thatch buildup from your lawn. By reducing these conditions, you take away the food and harborage these pests need for survival. Lastly, if you have a lot of access points through the siding of the home, you should consider a “seal” job. Most homes that get invaded have lots and lots of small cracks, crevices and gaps through which centipedes enter. When identified, all entry points should be reduced and/or eliminated with the use of a good FOAM SEALENT. 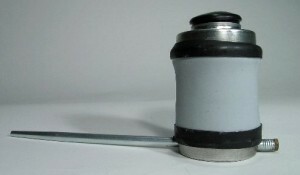 These small self charged cans are easy to use and come with an application hose making them well suited for small jobs. It will create a bead 3/8″ over 1000 feet long. For large jobs, get the bigger can. 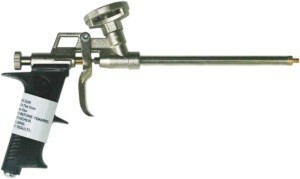 It will require a FOAM GUN to apply but this equipment is easy to handle and in the long run, well worth the investment. The can required for the gun is slightly larger compared to the can with the included hose. But the 25 oz FOAM SEALANT will cover up over 1500 feet when used to seal a 3/8′ gap. You will need some FOAM GUN CLEANER. to keep your gun clean and ready when next needed. Once your confident all entry points to your home have been sealed, you start treating the problem. To start, you’ll want to spray your homes foundation and ground immediately adjacent to the foundation. This will both kill any present and keep them from using the area. Do this first before treating the yard around the home. This way you’ll have a barrier in place so none will migrate from the lawn into the home. The best spray for long lasting fast results is DEFENSE SC. This actives work well because the liquid form is actually a micro-encapsulate. This means its essentially a bunch of small capsules which contain the active inside. These small microscopic capsules will open up over time exposing to expose active ingredient. The advantage of this design is that for many pests, its more likely to get on the target and lay on porous surfaces better compared to traditional emulsifiable concentrates. 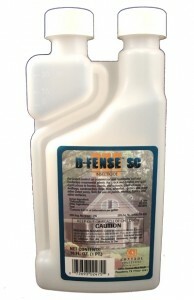 D-fense should be mixed .4- to .75 oz per gallon of water. Each mixed gallon will cover 800 sq/ft so expect to use 1-2 gallons of mixed material when treating the homes inside and outside. Basically the “capsules” are too big to sink down into porous surfaces and therefore will provide longer residual compared to normal concentrates. The end result is that you’ll have more of the active ingredient up high on top of the ground where centipedes are active. Dfense can also be used inside the home since its odorless and labeled for use on baseboards and even carpeting where people and pests will be walking. To put in place a protective barrier around the home, you’ll need to focus the spray on a band 3-6 feet wide. Basically covering a 2 foot area of ground and a 3-4 area up the side of the home. This way you have in place a protective barrier that will both repel centipedes and kill them if they choose to cross the treatment. Areas inside the home like baseboards, crawl spaces, basements, around anything wet like a refrigerator, decks, doorways, furnaces and hot water heaters should also be treated. Centipedes like dark, shady well hidden areas to nest so get all such areas properly protected. For most of the foundation and inside applications, you’ll need a good PUMP SPRAYER to spray. Make sure it can produce a wide “swath” to insure proper coverage. Pin stream sprays are not recommended. 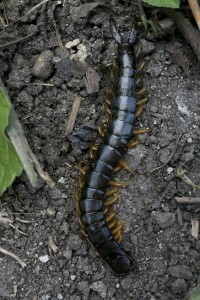 Since centipedes like organic matter, they commonly nest in drain lines. This will allow them direct access to homes through sinks, showers and tubs. 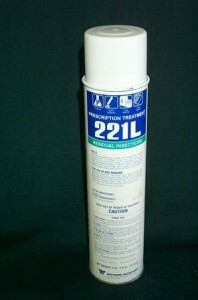 Treat down all drain lines with PT-221 AEROSOL. Labeled for use down this sensitive area, PT-221 will both kill and repel centipedes. It only takes 3-5 seconds of spray per drain. Do this once a month during the centipede season. Centipedes typically come from nests found around the home. Prime nests sites include pine straw, wood chips and rock gravel islands. For these areas, BIFEN GRANULES. should be applied once a month when activity is present. 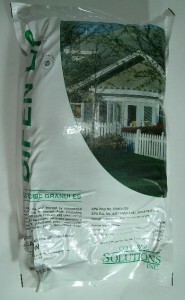 This product is a slow release, weather tolerant “sand like” granule which works by killing as well as repelling centipedes. Use 5 lbs for every 4,000 sq/ft of turf or mulch. Reapply once month when activity is noted; once every 3 months to make sure they don’t return. You will need a good GRANULE SPREADER to apply the Bifen G. Any push behind fertilizer spreader will work. But for hard to treat flower beds or island with heavy ground cover, the hand held applicator is better suited and very easy to use. Keep in mind the granules won’t work immediately like the spray. Basically they’ll take a good 3-5 days to kick in. But watering will help activate them; applying some just before a rain is recommended as well. Once in the home, centipedes will take advantage of dark secluded areas like wall voids behind sinks and cabinets. Treating these areas with liquids or aerosol is not suggested. But what works well and lasts long is DRIONE DUST. This product is highly active on centipedes and will last a year or more. 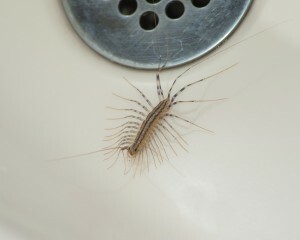 Blow small amounts into wall voids, under counters, into ceiling spaces for long term centipede control. Use a HAND DUSTER when making the application and be sure to get in between all the studs and insulation where centipedes like to nest along walls where activity is continuous. Remove electric outlet covers and light switch covers and dust inside the electric boxes. Drione won’t hurt the contacts but once applied, will keep centipedes out which not surprisingly like to target these locations. Okay. I have a really really bad problem. They are in the house and I can’t get rid of them. I will try the Bifenthrin. What month should I use it? I am in central indiana. Dforce Aerosol? Is it like a bomb? Or do I have to actually spray it? @Bret Earl: I think I just answered some questions you may have submitted and in fact I recommended you check out this article. So to answer the above questions, yes, the D-Force will help. But limit that to the outside cracks and crevices. For deep wall voids, go with the Drione Dust. 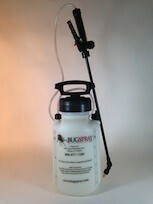 Treatments last a long time and it works on most any pest. View the video we have on it’s product page for more information about just how good it is for wall voids and other spaces where these guys like to hide. Are any of these products harmful to pets? I have a 20 pound dog. My kids have been bitten by centepedes in our apartment. Our landlord is in denial even though I’ve shown him the bugs. What can I do to control these creepy crawlers on my own? Just follow the treatment recommendations listed above. No doubt the Dforce applied to any crack or crevice you think they’re in can help. But in the long run, if you can isolate the wall void where they’re coming from and dust it with the Deltamethrin Dust, you’ll get much better control. I am going crazy right now. I live in tropical area and so far I’ve killed 3 centipedes that’s I have spotted in less than 1 week! They creep me out..I can’t sleep since I’m here thinking they may crawl into my bed. Its almost 3 am, I just killed 1 and I can’t go back to sleep. I’ll be trying the mentioned methods and hopefully I can get rid of them. I rent an apartment, 1st floor, and I’m seeing large centipedes on floor. How can I get rid of them? If you read our article above, you’ll see several products listed that control centipedes. Ideally if you can spray the outside foundation with the Bifen concentrate, this will really help by keeping any outside from foraging inside. In fact centipedes will readily start appearing inside homes every fall as insects start to seek a safe place to live during the winter. And since centipedes are hunting other insects, they invariably end up inside. So you state that you’re located on the first floor of your building and if thats true, its most likely that a good population of centipedes are living around the exterior of the building and from there, migrating inside. This is why a good exterior treatment would be the first thing to do because if you kill them there where they’re coming from, none will be available to get inside. The next step is to “centipede proof” your apartment. This can be done by applying Drione dust to all electric outlets (first remove the cover and then puff some Drione inside) as well as under all light switch covers, light fixtures (where they mount to the wall or ceiling), where pipes enter the room (typically under cabinets, sinks and in some cases, through the flooring) and around heating/air conditions vents. Drione is highly repellent to centipedes so it will prevent them from using these portals to your living space. And since treatments will last 6-12 months, you only need to treat once a year. Lastly, spray baseboards, around windows and door frames with either the Bifen liquid spray or the Dforce aerosol. This will need to be done once a month as long as they’re active; once every 3 months to make sure they don’t return.